A good friend of mine was born and raised in New Zealand. He moved to Canada more than two decades ago to pursue his life’s passion—falconry. 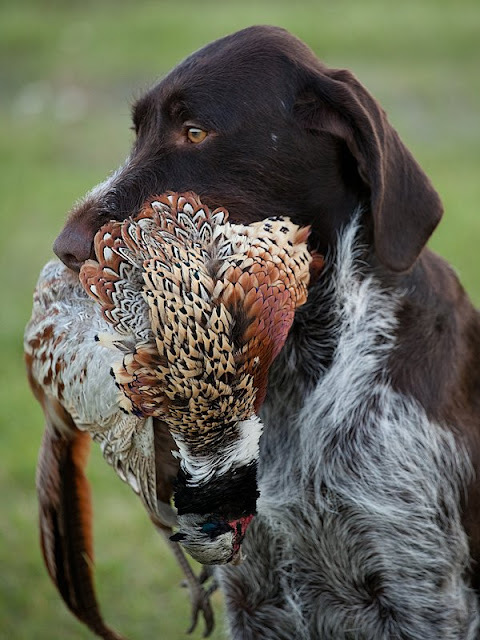 He had flown his birds of prey over Springer Spaniels and German Shorthaired Pointers in his homeland, but when he moved to Manitoba he decided to go with another breed. He wanted a sturdy pointing dog able to handle the tough cover and harsh climate of central Canada. After weighing the pros and cons of several breeds, he chose the German Wirehaired Pointer. He acquired two males and hunted with them for several years. Then he decided to add a female to his kennel. I was there when she arrived by plane from Germany. Despite having spent over 14 hours in a crate, the minute that pup was let out she jumped into her new owner’s arms, licked his cheek and then ran to a small pond on the other side of the yard. When she got there, without any hesitation, she dove in and gave chase to a family of ducks. She was just four months old. That young pup eventually grew up to be an absolutely superb gundog. That’s her in the photo above. To me, she will always represent the very essence of the German Wirehaired Pointer: a rough and tumble, intensely loyal, hard-working gundog. And the fact that a falconer from New Zealand living in Canada could get a pup from a breeder in Germany and have it start hunting the minute its feet hit the ground is testament to the incredible achievements of a small group of people who had the courage to follow a revolutionary idea nearly a century ago. The story of the German Wirehaired Pointer begins around the turn of the 20th century as the early experimental period of dog breeding was coming to an end. By then, many breeds had been declared separate and distinct and their stud books closed to so-called foreign blood. Kennel clubs, registries and breeding associations were forming across Europe and breeders were lining up to earn blue ribbons in the show ring for “improving” their breed. Increasingly, the trend among many breeders was to base their selection of breeding stock on two main criteria: appearance and pedigree. They believed that selecting the best looking animals and maintaining them within a closed registry was the most appropriate way to improve their dogs. But hunters soon discovered the fatal flaw in this way of thinking. They realized that selecting dogs based on appearance alone was futile. Unless a strict testing program was established to select dogs based on their inherited hunting abilities, there would be no way to make any progress. However, most breeders stopped short of actually challenging the closed stud book and the concept of pure breeding. They still believed that breeds should be kept separate and breeders should avoid “contaminating” their lines with outside blood. 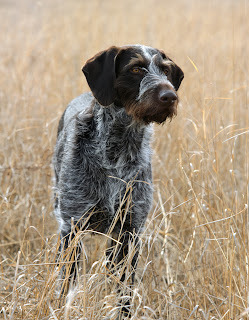 The creators of the German Wirehaired Pointer held a different view. They believed that all rough-haired pointing breeds were members of the same family and that breeding among them should be allowed. They also believed they should be able to cross to an unrelated breed, the Deutsch Kurzhaar (German Shorthaired Pointer). Naturally, many members of the hunting dog establishment considered this attitude an affront to the sanctity of pure breeding. Yet, despite considerable risk to their reputations and fierce condemnation by their peers, supporters of the German Wirehaired Pointer stuck to their convictions. Like other breeders of the time, they knew that the only way to breed better hunting dogs was to select breeding stock based on the dogs’ abilities, not their outward appearance. This is the essence of the famous saying “durch Leistung zum Typ”, which means “form follows function”. But unlike the others, these early visionaries went even further. They believed that everything follows function, even the most sacred tenant of them all: breed purity. They argued that dividing the varieties of rough-haired dogs into supposedly pure, independent breeds was just “hair splitting”. They could see that it was leading to the splintering of forces at a time when everyone should be working together. So they decided to join forces and even came up with slogans to summarize their approach. They urged each other to “take the good where you find it” and to “breed as you like but be honest about it and let the results be your guide”. Even today, such ideas can cause a stir. But back then they must have seemed like heresy to members of the canine establishment. 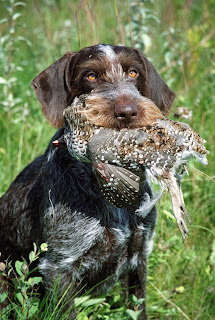 In an effort to gain some insight into what it must have been like at the time, I asked a friend in Germany, Wilhelm Heinrich, a GWP owner with a keen interest in the history of the breed, to translate portions of club newsletters published by the Verein Deutsch Drahthaar and to offer me his thoughts on the early years of the breed. In the early years, GWP breeders mainly used Stichelhaars and Pudelpointers in their programs. Griffons were also used, but less frequently. Soon crosses to German Shorthaired Pointers were undertaken, as well. This led to some difficulties in breeding a proper wire-haired coat, but rapid progress was made in terms of field ability. In 1904, perhaps reflecting the patriotism of the club members, the Verein Drahthaar (Wirehaired Club) was renamed Verein Deutsch Drahthaar (German Wirehaired Club). After all, Germany had developed its own long-haired pointer and its own short-haired pointer, so the VDD’s mission was to give Germany its own national wire-haired pointer. At first, the new club grew slowly. At the outbreak of the First World War in 1914, there were only a few dozen members and a total of 56 entries in the club’s stud book. After the war the club saw phenomenal growth. In 1921, the VDD passed the 1,000-member mark. By 1926, German Wirehaired Pointers had become so popular that they made up nearly half of all dogs in the German versatile dog registry. In 1928 the breed was finally recognized by the Delegate Commission and, by the middle of the 1930s, it had almost achieved the status of Germany’s national dog. In the difficult years that followed, the German Wirehaired Pointer, like all other German breeds, suffered tremendously. After the war, the breed stock was strongly diminished. For example, my mother gave away our dog in late 1945 because there was not enough food—they had not enough for my three little brothers. However, the first post-war meeting of the VDD took place in 1947. In 1949 Germany was divided, but the VDD still remained as one club because the borders were open. It is said that breeding during the first years after WWII was quite chaotic, and that they used almost everything that had a tail. In fact, Weimaraners were used, as well as German Longhaired Pointers and German Shorthaired Pointers. Breeders after WWII were also faced with a difficult problem. They were allowed to breed dogs, but they were not allowed to have guns. These regulations only remained in place for a few years in the West, but for over decade in the East. So in an East German hunting magazine from 1956 it was noted that the Eastern dogs were quite good, but that they were not used to the sound of gunfire! The first Hegewald test after the war took place in 1949. Eighty-three German Wirehaired Pointers were entered. In 1954, 200 GWPs were nominated for the Hegewald in Giessen. The last Hegewald test with combined Western and Eastern groups was in 1959. After that, East German hunters were not allowed [by their government] to attend. In 1961 the wall was built, and because of the Cold War, all contact was cut. It was not reestablished until 1989. In 1992 the Eastern and Western clubs were reunited." Only a few German Wirehaired Pointers were exported prior to the Second World War, but in the 1950s good numbers of them made their way to the US and other European countries. In 1959, the German Wirehaired Pointer Club of America was formed and the breed was recognized by the AKC. Through the 1960s and ‘70s, the breed’s popularity grew steadily in North America. In 1971, Group North America, a chapter of the German club, was formed in the US. Members of the club test and bred their dogs according to the regulations set out by the VDD, the parent club in Germany. In 1974 a similar group in Canada was formed but did not become an affiliated chapter of the VDD until 1984. Today it is clear that the goals of the breed’s founders have been achieved and their approach to breeding, so hotly contested in the early years, completely validated. 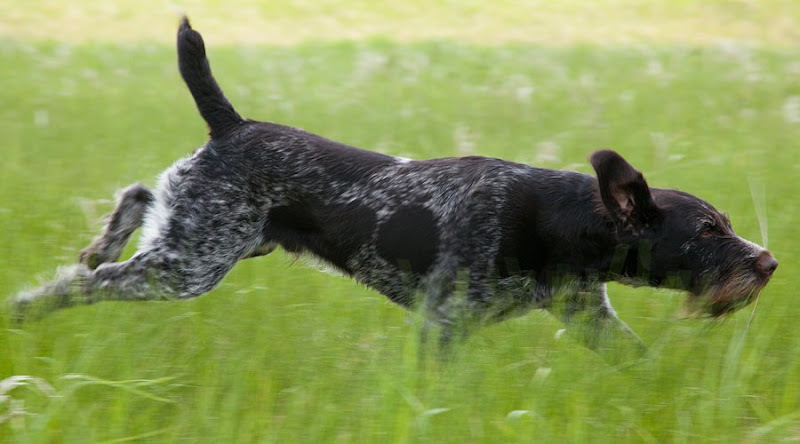 The GWP is among the most successful pointing breeds on the planet. Few can rival its versatility, none come close to its popularity in Germany, and it is gaining supporters around the world every year.